Vegetable friends Elliot, Sedgewick and George are busboys at Pirate Times Dinner Theater. They would like to be stars of the show, but their character flaws keep them from being in the limelight. The pals get a chance at heroism when they are tossed back to the 17th century to aid in the fight against a tyrant. We are so excited about our upcoming movie day with the kids on Sunday May 29th at 9:30AM! 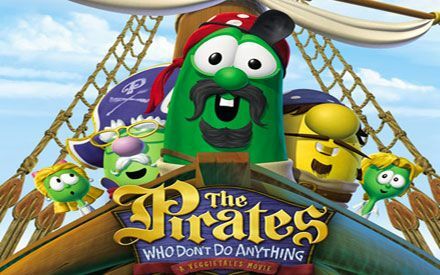 During this time we will be watching the VeggieTales animated movie, “The Pirates Who Don’t Do Anything.” The kids will remain in the WegoKids room throughout the Sunday School hour as well as the worship service hour. We also encourage the kids to come dressed as a pirate for the pirate costume contest. There will also be other fun activities for the kiddos!